Subaru is recalling certain 2010-2013 Forester, and 2010-2014 Outback, WRX/STI, Legacy, Tribeca, and 2010-2011 Impreza vehicles. This is part of the massive Takata airbag recall for vehicles worldwide. The National Highway Traffic Safety Administration (NHTSA) says this latest U.S. recall affects close to 500,000 vehicles. Subaru of America is recalling the above vehicles sold or ever registered, in the states of Alabama, California, Florida, Georgia, Hawaii, Louisiana, Mississippi, South Carolina, Texas, Puerto Rico, American Samoa, Guam, the Northern Mariana Islands (Saipan), and the U.S. Virgin Islands. 43,394 total vehicles are affected in these U.S. states. Subaru is also recalling the same vehicles in the states of Alaska, Colorado, Connecticut, Idaho, Iowa, Maine, Massachusetts, Michigan, Minnesota, Montana, New Hampshire, New York, North Dakota, Oregon, Rhode Island, South Dakota, Utah, Vermont, Washington, Wisconsin, and Wyoming. This recall affects 452,630 vehicles. These Forester, WRX/STI, Outback, Legacy, Tribeca, and Impreza vehicles are equipped with Takata airbag inflators assembled as part of the passenger frontal airbag modules used as original equipment or replacement equipment. In the event of a crash necessitating the deployment of the passenger frontal airbag, these inflators may explode due to propellant degradation occurring after long-term exposure to absolute humidity and temperature cycling. An explosion of an inflator within the passenger frontal airbag module may result in sharp metal fragments striking the front seat passenger, driver or other occupants resulting in serious injury or death. Subaru has notified owners, and dealers will replace the front passenger air bag inflator, free of charge. The recall began on January 25, 2019. Owners may contact Subaru customer service at 1-844-373-6614. Subaru's number for this recall is TKA-19. Owners can also use the Subaru VIN lookup tool to check all recalls. 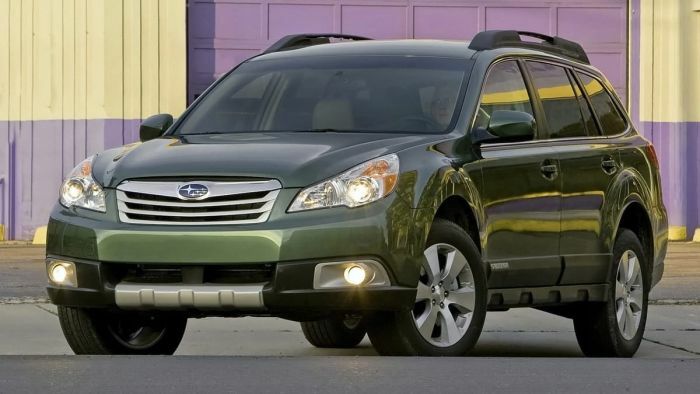 Is Subaru actually recalling 500,000 vehicles or is your title incredibly misleading? NHTSA says 452,630 vehicles are being recalled for their Takada airbags. It goes on to say Subaru is recalling just 43,394 vehicles. Why does the title quote 500,000? I'm very confused. Received my safety recall letter on Tuesday. I dropped my 2014 WRX off Wednesday after work, picked it up Thursday after work. Very quick turnaround! Nice report, looking forward to future reports!